It wasn’t a particularly cheap idea. I have a few pairs of socks with toes in, and they seemed to help a little, although they are not the easiest things to put on. (Neither are the shoes.) It felt right to be able to move my toes independently inside my shoes. 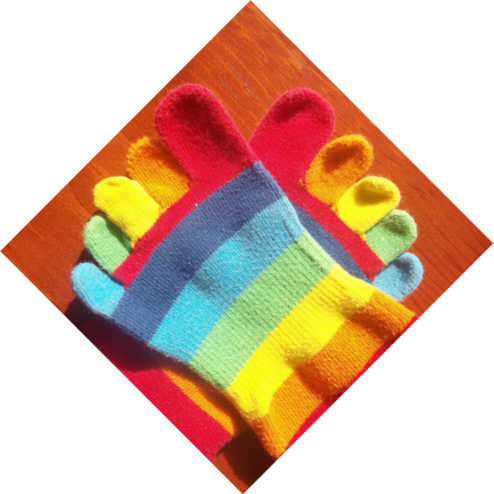 The slight separation between toes that the socks afforded seemed to reduce the squashed-together feeling. Vibram Fivefingers were designed for active, outdoor types who wanted to move more naturally (barefoot) without hurting their feet. Such people are not very common, ad could be considered to be slightly eccentric. The shoes are not widely available on the high street, and they cost enough that I didn’t want to order a pair online only to find that the fit was completely wrong. Anyway, Cotswold Outdoor sell the shoes, and there is a branch in Reading. I duly turned up, only to discover that stocks were low and there were no 43s. 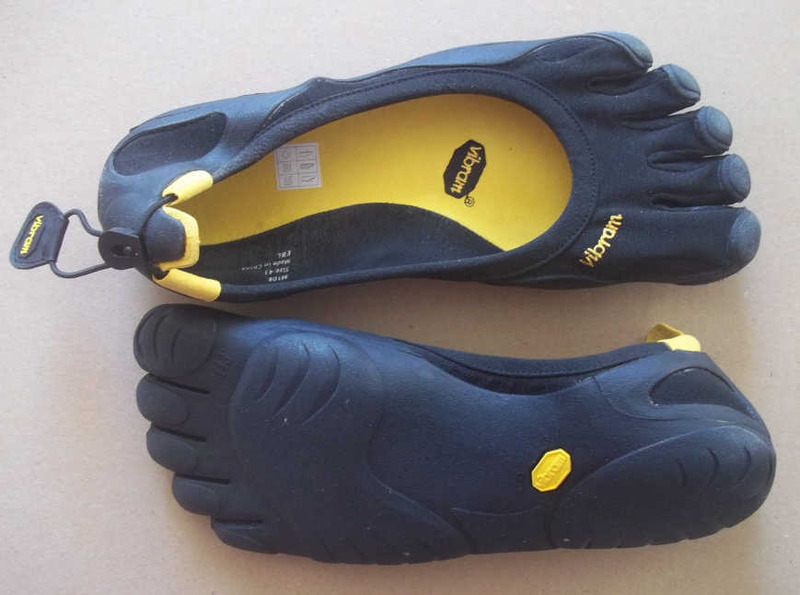 The helpful gentleman in the shop ordered a pair of Classic Fivefingers for me to try on, and they turned up last Friday. They fit well enough for my immediate needs, which are primarily indoor (I have less of a problem outside, with more space around me – this is no doubt due to the neurological nature of my problem). The shoes I have remind me a little of flat court shoes (It’s the low, rounded front that does it), but more comfortable. I intend to use them around the house and – after I get some more (soberly coloured) socks with toes – at work, which will be mostly around the office. So far, they seem to be helping. The toes in the shoes are quite flexible, but have enough stiffness that my own toes seem less inclined to curl. And the separation inherent in the design is good – my feet certainly feel more comfortable. Pingback: Les chaussures minimalistes ou « chaussures à orteils » – Parkinson… Ailleurs !